Okay. Finally we get to see my top ten. I have chosen these pieces based, in part, on comments and popularity. But, more than anything these are pieces that really speak to me somehow. I also believe they all have a certain graphic power that makes them effective enough to make a viewer pause and study the composition. I find them to be effectively thought provoking and/or emotionally inspiring and sometimes clever. And, those qualities are very important for any graphic design, right? Number 10. The Weakest Link is one that I have gone back and forth on as to whether it should even be in the top ten. But, in the end it has won me over. 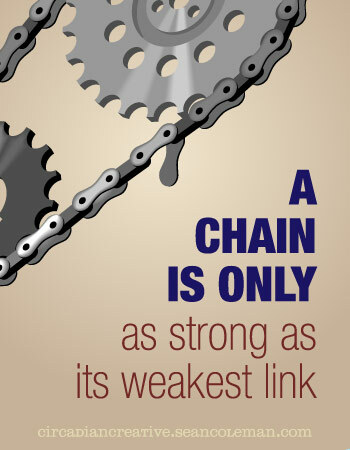 I feel that it makes good use of a modified vector (stock) artwork (the gear and chain) to imply the instability of a weak link. the image gives a sense that the system is in jeopardy of a break down because of one unreliable element. It’s still running, for now, but it kinda makes you cringe a bit doesn’t it? The typography creates an upward left to right wedge. It is a stable shape that is grounded but the first part of the phrase “a chain is only” is set in all caps in a bold, heavy face and sits atop a visually weak “as strong as its weakest link.” This sense of tentative stability in the typography helps lend to the notion of a weakest link. As I write this I’m not sure I consciously intended this at the time of the design. hmmm… maybe I should have ranked it higher? Number 9. Number 9. Number 9… The End/Abbey Road. Ok so I made this one “number 9” just so I could be funny. This one actually was a tough one to rate. 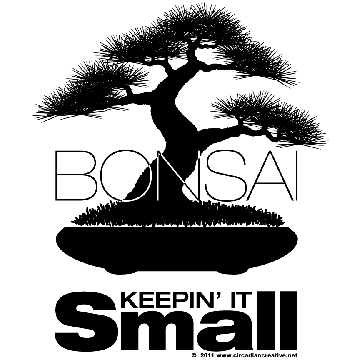 It is a very simple image but sometimes less is more. For anyone who is a Beatles’ fan this one might have the potential to bring a tear to your eye. It just works in a very simple plain way. It recreates the image on the cover of the last album from the Fab Four. Number 8. Wacom Tablet, Birds on a wire. This one is a bit rough in spots but the intended image is very intriguing I think. The image of birds on a wire has always been a powerful one for me. Birds are very mysterious creatures and have fascinated mankind since our beginnings. Depending on the context, the image of a bird can produce just about any emotion. Peace, love, fear, anxiety, anger… It is for this reason, birds are also a recurrent archetype in human culture for as far back as history and archeology can take us. These birds take me back to a lazy Sunday afternoon. Its too cold and wet to go outside. The weather has created a mood and the only thing you can seem to bring yourself to do is sit and look out the window, across the street, up to the sky. Power lines, and a small flock of birds waiting for the transient gray sky to to either break into blue, or open up and drench the earth with another downpour. Hmmm, them are some powerful birds. What does this image do for you? Number 7. You can’t get blood from a stone, or can you? This was one of my favorites in the Book Cover design series. In fact I think that whole series was my favorite I love the simple typography and imagery. The stone dripping with blood stands out on the dark gray background and I think it is a powerful illustration. How does the composition affect you? If this were a book cover for a real book would you be intrigued? would you pick it up and at least read the inner sleeve? What do you think the book would be about? Number 6. 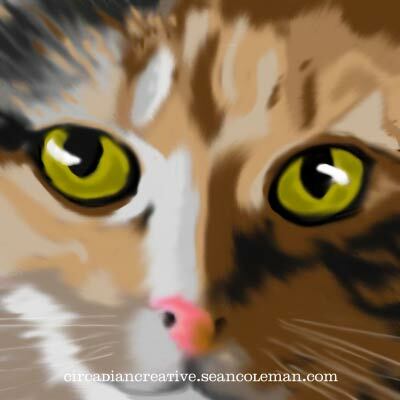 Image number 6 is actually a portrait of my cat Shelby. This image was created during October 2010’s Wacom Tablet month. This is probably one of the best illustrations of that series. This image inspires me. It will never let me forget that I must continue to experiment with the tablet. My roots are in sketching and painting and the tablet is the perfect way to stay on the computer and still be able to go back to basics (somewhat) as an illustrator. Number 4. Snow Ghost. This image possesses a subtle cleverness that I really enjoy. It is just fun to look at. It could be an illustration for an article on post global warming holiday traditions. OK maybe stretching it a bit there. But one thing is certain, this image will always remind me to think on a slightly different level when creating an illustration. Number 3. Mountaineers Are Always Free. I really had a great time with this one and I was hoping it might get picked for a the Fifty of Fifty project. I created it rather quickly and missed the mark on some of the project’s basic criteria. Besides, I believe the West Virginia designer was already decided upon before I shared it with the project’s creator. What I love about this image is the vintage signage feeling I get from the type treatment. This antique feeling is accentuated by the sephia tone image of the mountains in the background. I was trying to meld two time periods. The first being the 1860’s which was when West Virginia was born. The second is the 1940’s and 1950’s which is the time period I think of in many ways when I think of my home state. 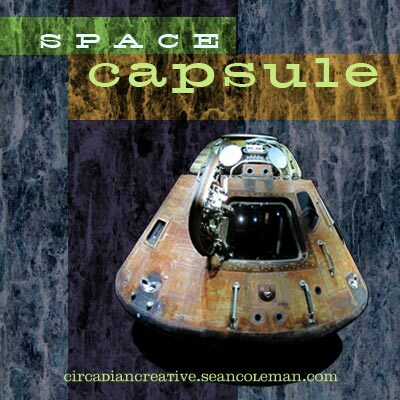 While growing up I was surrounded by artifacts from the mid century and that has been a huge influence and inspiration for me in so many aspects of my life and creativity. Stay tuned! If you like this design it, or a variation, will be the July design available sometime in the coming week at the Circadian Creative Store! Number 2. 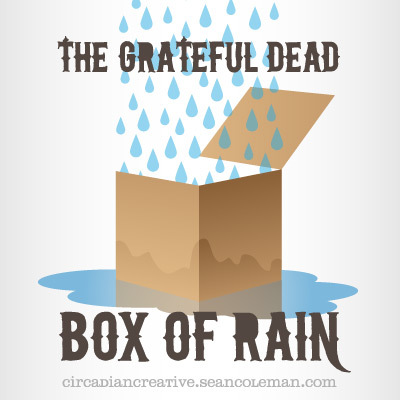 Grateful Dead, Box Of Rain. Perhaps too literal, but the illustration and typography are definite winners. There is something about the way the box is capturing the rain but is also being deteriorated by it which has some symbolic value and does relate to the song. So, Maybe not too literal after all. I just love the illustration in this one and I am very proud of it. Number 1. 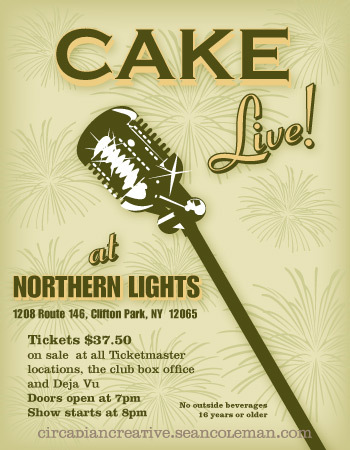 Drum roll please… and the winner is… The Cake poster, Live At Northern Lights from last August’s Music Art Month. I love the imagery, the color the texture and the typography. I feel like this works very well as a concert poster and I think the design would meet the approval of the band. Actually I was in contact with the band’s manager during the five pieces I created for Circadian Creative. He liked all of them but frowned upon the third design, which featured a baker running with a cake. “The band does not endorse artwork featuring baked goods.” I would have to agree with that policy. Well that’s all for now folks! I am very sorry that it has taken me this long to compile the top ten lists. The next one will be “The Worst of Circadian Creative” I will try to get that one published soon. I have really enjoyed the break that has come in the form of neglecting the website but I am also very eager to start posting regularly again. So, I hope to have the worst ten list done next week and then it is on to sharing some projects and other creative endeavors! 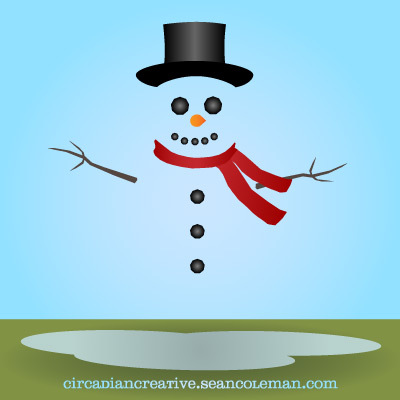 Follow Circadian Creative on Facebook and Twitter!